The only one I'm not really liking is the one with the giant "O" on it. It actually looks like the top the marching band wears. The script "Ducks" looks really cool, and the pinstripes on the gray are not pinstripes--They're the words to "Mighty Oregon!" I think they did a pretty good job. It could have been worse (but I'm one of the ones who thinks the football uniforms aren't that bad). PurplePrideTrumpet - I think the five normal looking uniforms look fine. The one with the Giant O on it is simply not a baseball uniform. It's hideous, and if I was a prospect considering a NW school, I would eliminate Oregon based on the one ridiculous jersey alone. What is tells me is Oregon is on the cutting rdge of sports fashion, but their fatal flaw is, they don't know when to quit. That's poor judgement by Ducks Sports Mgmt. and I am also sick of all the football combinations. They have a few great football uniforms. Stick with those. A few weeks back they had white helmets and jerseys, and yellow pants. Totally absurd and laughable to look at. They do have at least one tremendous coach: Vin Lanana! Man what a breath of fresh air that guy is. The uniforms with the scripted Ducks are nice (I prefer the one second from the left, with the full sleeves instead of the tank-top one on the right), but the pin-striped road jerseys just do not look nice. Too busy... why a number on the front and that stupid O on the hip? And that random dark green line along the side of the pants? I just don't get it... sigh... call me traditional, but they just made better jerseys 75 years ago than they do now. The best line? "the annoying thigh logo, the guy wearing his IQ on his chest." In all fairness, he has been very critical of the Oregon football jerseys and their relationship with Nike, so you have to take what he says with a grain of salt. He's not exactly impartial. That Phillies jersey is pretty sweet. It kind of reminds me of the Giants home jersey, simple and bold. Now that I think about it, I don't really like the green one either. I like the good old white and gray. Save the colors for batting practice. 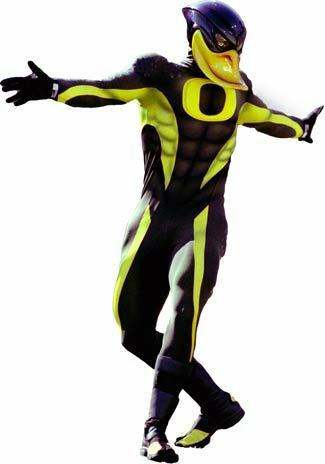 And I may be alone here, which is fine, but I think the Duck football uniforms look pretty cool. Especially the yellow helmets (yeah I said it). When you see them up close they have a subtle flame design on them. What you don't like things like this? Or this great way to show off your steroid induced pythons?? Gahh! 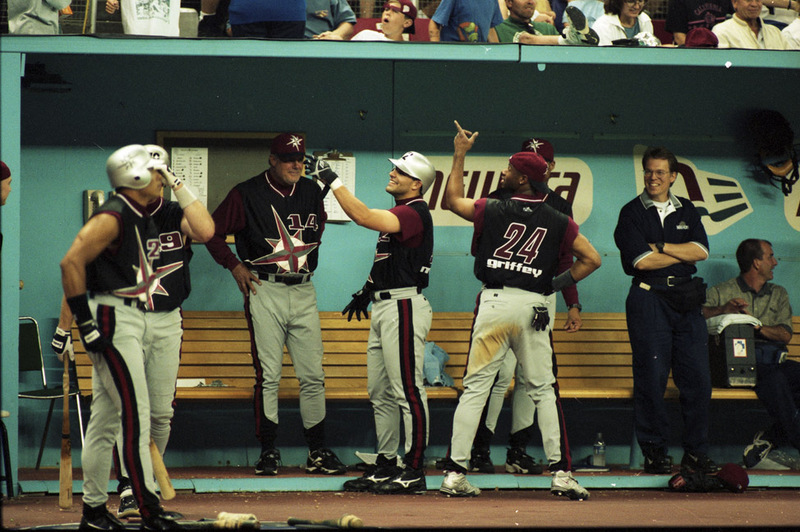 I thought all the pictures of the "futuristic" Mariners jerseys were burned and the negatives shredded. The regular Mariners uniforms? Pretty good looking. I seriously wonder how the really bad designs even get off the drawing board. . .
What got my attention is the part of the story where someone from UO said something like, "The first designs they showed us were really out there..."
I just want to know what Roboduck's secret is... those obliques are amazing!!! So I actually read the article about the release... Apparently the one with the big O is a throwback to unis they wore in the 70s... Hmmm 70's unis always a good Idea right?? HA! The White Sox jerseys with collars and shorts. I don't see those being made by Mitchell & Ness anytime soon. Really, there's very few teams that made it through the 70s unscathed. The gun might would be frowned on today but the making the C out of the smoke is really clever. 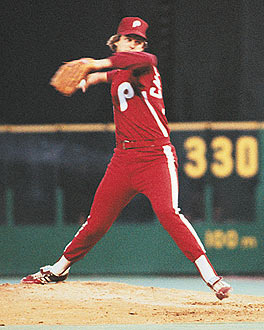 I just thought of this jersey because I was wearing my 45s hat today. You can actually buy the "regular" white and green jerseys at JustSports in Lloyd Center. Of course, that post is referring to the Ducks unis from the first entry.